The Palm Oceana is located in the trunk of The Palm Jumeirah. Its a unique community at the most prestigious location in dubai. A vibrant residential and resort destination, Palm Oceana has private beach access and sea view. Palm Oceana is an ideal retreat with remarkable array of services and amenities. Palm Oceana has 644 apartments and a 5 star hotel managed by Move n venpick Hotels and Resorts. Guests and residents can enjoy private exclusive access to their 230 metre long sandy beach. There is a lazy river and an amazing temperature controlled pool. In addition to these there is a a well equipped fitness club and exciting pool side restaurants. 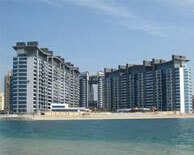 The Palm Oceana offers the highest quality apartment choices on the Palm Jumeirah.